OUR SOLUTION FOR OILY, DRY AND FLAKY SKINS. DOUXO® Seb balances, hydrates and moisturises oily, dry and flaky skins while protecting the skin barrier. Minimises unpleasant odour. Sebum production imbalance is associated with ceramide deficiency in the lipid structures of the skin barrier and excessive free fatty acids which gives greasy skin the characteristic smell of "rancid butter". 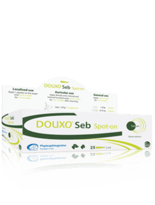 DOUXO® Seb is a unique combination of Phytosphingosine with soothing and moisturizing ingredients. Phytosphingosine is a fundamental component of ceramides which helps to re-balance ceramide production. 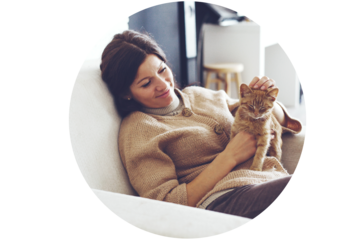 Because of their unique formulae, DOUXO® Seb products can help manage all types of sebum production imbalance, whether they are dry and the skin is very scaly, or greasy and the skin produces excess sebum. Apply one pipette directly onto the skin. The contents of one pipette can be applied to several areas.